Besides airfare, hotel costs are usually the next highest expense in your travel budget. Thus, I am often looking for the best deals for my accommodation bookings. There are last minute hotel booking apps that allow you to secure your rooms at a fraction of the price but I like to be well prepared for my trip e.g. booking hotels weeks in advance so that I can plan my transportations to attractions from the hotels. Even with last minute hotel booking apps, you are not guaranteed the locations and prices you want so it could be a bit of a gamble if you are travelling with kids. 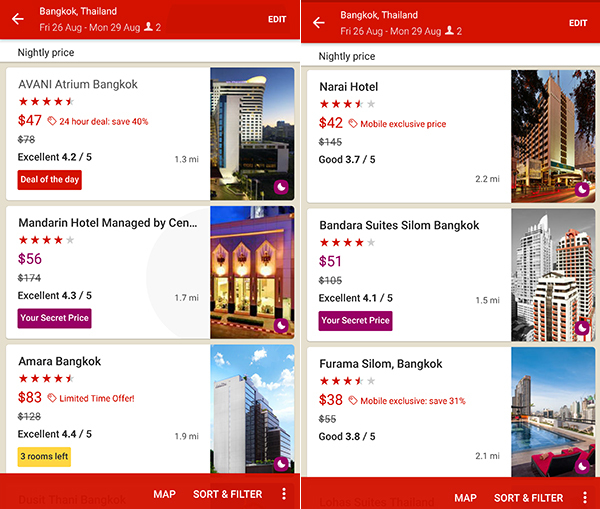 During the planning of my recent Bangkok trip, I noticed that Hotels.com offers one of the most value for money hotel booking deals and even more so if you use their mobile app to book hotels. 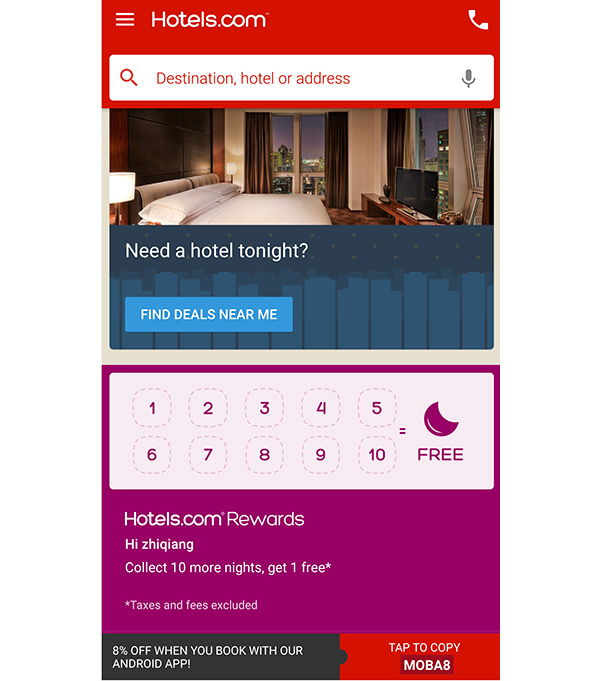 Right on the first page you see on the app, you find an 8% off coupon code (see picture below) when you book using the Hotels.com mobile app. This is a very different approach from other hotel booking sites where you have to Google for their promotion codes or coupons. If you are a frequent traveller, Hotels.com loyalty programme also rewards you for booking rooms with them – if you book more than 10 nights with them, you get a night free and these 10 nights need not be on a single booking, you can spread them out over multiple bookings. Do note that the value of your free night is equal to the average rate of the 10 nights you collected. The value of a free night does not include taxes and fees. You can redeem your free night for a night of greater value and pay the difference. Besides the 8% off with the MOBA8 coupon code (subject to change), there are Secret Prices exclusive to Hotels.com app users, for selected hotels and selected dates. Look out for the “Your Secret Price” purple box in the hotel search listings – also look out for other promotions e.g. Mobile exclusive price and 24 hour deal. These deals together with the 8% off coupon had saved me quite a lot of money in my Bangkok hotel booking and these savings are real when you compare them to what other hotel booking sites offer. 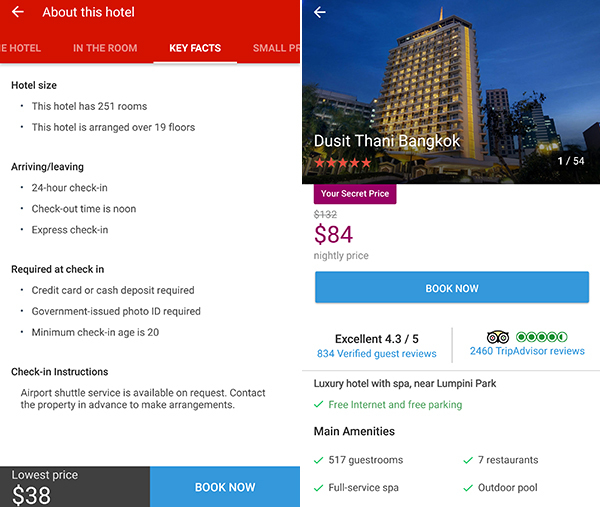 The Hotels.com app is also very well designed – the layout is very clean – once you click through to see more details about the hotel, you see prices, reviews and ratings and a picture carousel (which you can scroll through lots of hotel pictures) as well as key points about the hotels e.g. do they offer free Wi-Fi, do they have a pool and/or restaurant. However, if you need more info, just click on the “about this hotel” and you find more details about the hotels. Besides Hotels.com mobile app which offers value for money hotel bookings and user-friendly features, Hotels.com also has an interesting Mobile Travel Tracker at mobiletraveltracker.hotels.com which offers interesting insights on traveller behaviours. For example, do you know that Singaporean millennials spend over 3 hours on any given day during their travels glued to their mobiles. A whopping 86% of this time is spent on social media channels alone. Interestingly, nearly 1 in 2 Singaporeans admitted to uploading photos on social media just to make their friends jealous (49%). This was especially the case for the millennials, who rated this to be the number one use of their time spent on social media during their travels. This is based on a global study of 9,200 travellers across 31 countries. Holidays are typically meant to help us relax and unwind but surprisingly, the Singaporean competitive side peaks during our travels! 12% of local travellers engage in a ‘Facebook Face-Off’ with their travel companions – checking to ensure that their content is better than their travel buddy’s. Interestingly, and perhaps not too surprisingly, it is the men who are more inclined to get caught up in a social media showdown (18%) while only a minimal 2% of women engage in such competitions. In fact, when travelling, men spend a longer time on their mobile devices and on social media channels than their female counterparts – a significant 21% and 14% more hours to be exact. It has been long debated that travellers these days are increasingly becoming dependent on their phones when on holiday, given how easy it is to access a host of information on your devices. While that may be true, it has been revealed that when it comes to travelling, Singaporeans are prioritising right by spending almost 50% more time exploring attractions and immersing themselves in the sights rather than being lost on their mobile devices. It is great that mobiles can now be used for maps and translation, allowing travellers to be better equipped with the information they need to experience the city like a local. In fact, 30% of Singaporeans rely on their mobiles to learn the local lingo and 23% turn to translation apps to do so. We are a generation of foodie travellers – 63% of global travellers and 68% of Singaporeans rate restaurants and food markets as the number one type of content they are searching for on their mobile devices. However, you’d be surprised to find that the ladies are putting their devices to a more practical use by looking for maps and directions to guide them (65%). Men, it seems, are better guided by their appetites as 71% of them use their devices primarily to search for good eateries. In fact, bars to go to (25%) and sights to visit (66%) fell far behind on their list. So, the next time you find yourself on a trip with male companions, worry not about where you’ll be eating your next meal – the boys most probably have it all sorted!